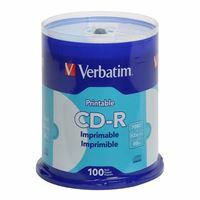 Create high quality, customized labels for your CDs with Verbatim White Inkjet Printable CD Recordable discs. These discs have been extensively tested for compatibility with inkjet disc printers from Primera, Microboards, Epson and more. These discs offer 700MB or 80 minutes of CD-quality storage capacity and are compatible with disc burners up to 52X speed. These are one-time record discs, ensuring that your music, images or other data will not be erased.